In this study, we aimed to evaluate the level of public awareness of hematuria. In September 2017, a survey of randomly selected 400 patients who presented to our outpatient clinic in a period of 1 month was conducted. The survey focused on patients’ background and knowledge of urology and hematuria. A hundred and sixteen (29%) females and 284 (71%) male patients participated in our survey. Two hundred and seven (51.7%) patients were under age 50 and 193 (48.3%) were over 50 years of age. 155 (38.8%) patients were primary school graduates, 59 (14.8%) - secondary school, 98 (24.5%) - high school, and 88 (22%) were university graduates. Three hundred and thirty-two (83%) patients described that they have previously seen blood in their urine and, 68 (17%) patients did not. There was no statistically significant difference in patients who went immediately to the urology outpatient clinic in the case of hematuria, but those who thought that they may have tumor were older in age. No significant difference was observed in the answers to the questionnaires between gender and between hematuria experience. Those who immediately went to the urology clinic in the presence of hematuria were in the smoking group. Public awareness of health is of utmost importance. However, it was seen that even patients who may be at risk for malignant diseases were not able to lead the way in public awareness. The way to reduce health expenditures is to educate the society. It is evident that this education is still needed today. Hematuria is a clinical finding that can originate from anywhere in the urinary tract and can be the first sign of many diseases, including malignant diseases, of which prevalence may range from 4% to 19.3% (1,2). In clinical practice, hematuria comes out in two ways. Macroscopic hematuria, defined as blood in the urine that can be visible by the patient, allowing the patient to seek medical care in a faster manner and microscopic hematuria defined as more than 3 red blood cells at 2 out of 3 urine analyzes at 2-3 week intervals as indicated in the American Urological Association (AUA) guidelines (2,3). It should not be forgotten that the urine sample should be fresh, properly taken, and the mid-stream urine for the detection of hematuria. The detection and grade of hematuria can be quantitatively determined by counting red blood cells per 1 mL of urine (chamber count), or by direct examination of the sediment of the centrifuged urine (sediment count) or indirectly by dipstick (4). Dipstick test is the simplest test for the detection of hematuria and is considered a color change due to oxidation on the test strip. However, the presence of erythrocytes is not definitive and the result of the dipstick test must be confirmed by microscopy before starting further studies (4,5). It is necessary to exclude cases where the urine color is red, which is called pseudohematuria, and without erythrocyte. Macroscopic hematuria usually signifies an important underlying pathology. At least half of the macroscopic hematuria patients have an important urogenital system disease (5,6). For this reason, there is no debate about the need for further evaluation to determine the underlying cause of macroscopic hematuria (4). Clinical significance is particularly variable in microscopic hematuria, therefore, it is recommended to use risk factors to evaluate patients and to ignore clinically insignificant hematuria. In a study conducted in a group of patients with microscopic hematuria among the general population, the incidence of urological or nephrological disease was 13-50% and the prevalence of cancer diagnosis was 1-2% (7). The AUA guidelines suggest evaluation of patients with asymptomatic microscopic hematuria if there is a risk of having urological or nephrological disease (4). On the other hand, the British guidelines recommend urgent referral to an urologist in the presence of microscopic hematuria in an age over 50 years and non-urgent under the age of 50 years (8). In September 2017, a survey of randomly selected 400 patients; about one-third of the patients who applied to our clinic in a month, with any complaint were conducted in the urology outpatient clinic at Bülent Ecevit University Hospital. After approval of the Bülent Ecevit University Ethics Committee (approval number: 2017-84-09/08), a questionnaire was administered to all patients who participated in the study and provided written informed consent. The survey focuses on patients’ background and knowledge of urology and hematuria. The exclusion criteria of this study were being illiterate and refusing to participate. The patients were divided into various groups according to their age, level of education, smoking habit and hematuria experience (Table 1). Statistical analysis were performed with SPSS 19.0 software (SPSS Inc., Chicago, Illinois, USA). Descriptive statistics were calculated in terms of frequency and percent distribution. The chi-square test or Fisher’s exact test was used to determine differences between the groups. A p value of less than 0.05 was considered statistically significant. A hundred and sixteen (29%) female and 284 (71%) male patients participated in our survey. Two hundred and seven (51.7%) patients were under the age of 50 and 193 (48.3%) were over the age of 50. One hundred fifty-five (38.8%) patients were primary school graduates, 59 (14.8%) - secondary school, 98 (24.5%) - high school, and 88 (22%) participants were university graduates. Three hundred and thirty-two (83%) patients described that they have previously seen blood in their urine and 68 (17%) patients did not. 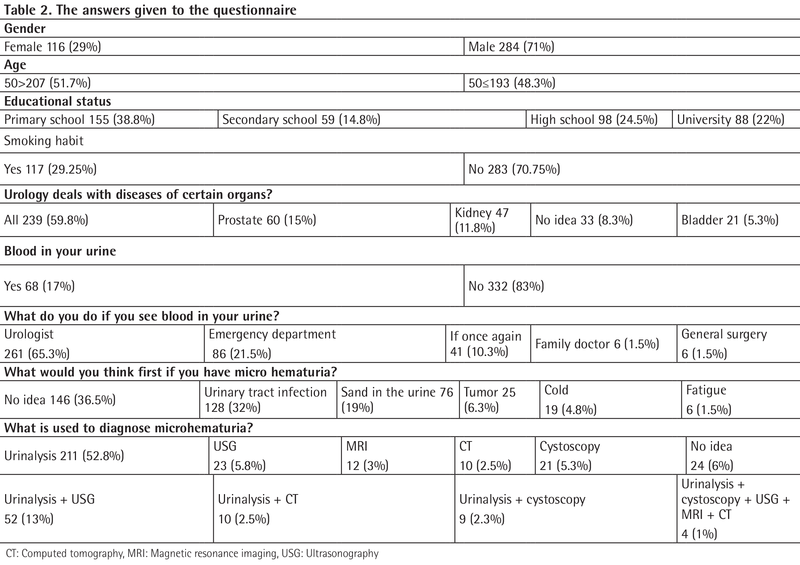 The demographic characteristics of the patients as well as the answers given to the questionnaire are shown in Table 2. When we separated the patients into two groups according to their age, it was seen that who had full opinion on urology were younger in age. There was no statistically significant difference in age between patients who went immediately to the urology outpatient clinic in case of hematuria, but those who thought that they had tumors were older in age (Table 3). When we divided the patients into two groups according to their gender, it was seen that the majority of patients were male in older age. 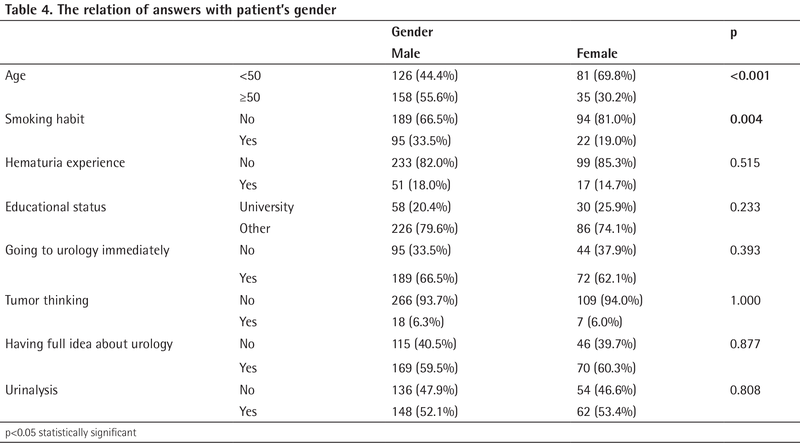 No significant difference was observed in the answers to the questions in terms of gender (Table 4). 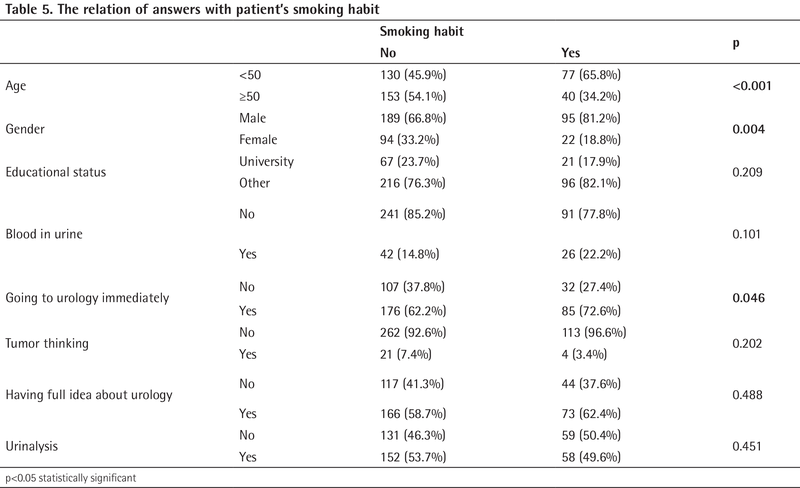 When we separated the patients into two groups according to their smoking habit, the majority of smokers appeared to be males of younger age group. It was seen that those, who immediately went to the urology clinic in the presence of hematuria, were in the smoking group (Table 5). When we divided the patients into two groups according to their hematuria experience, the majority of patients were found to be in the older age group. There was no statistically significant difference in the answers given to the questions between the two groups (Table 6). Urology is a medical science dealing with human urinary and male reproductive system. Every year a significant number of patients are presenting to the urology clinics. Early diagnosis means catching diseases in their earlier stages and enabling earlier treatment. The importance of preventive health care is understood when the economic burden of health expenditures in the country is considered. It was estimated that the amount to be spent for cancer patients in the USA in 2010 was about 126 billion dollars. The size of the economic burden will be better understood when the other benign causes are considered as well (9). It is recommended to perform annual urine examination and prostate-specific antigen measurement and simple blood tests especially for patients over 50 years of age (10,11). In case of macroscopic hematuria, patients will immediately seek medical help, but the identification of microscopic hematuria and the patients’ care on its importance need some degree of awareness. There are various factors contributing to the etiology of hematuria. Although malignant causes may be considered as the most frightening one, early detection of stone in the urinary system and benign kidney diseases and diseases of lower urinary tract that may require close follow-up are also important for early diagnosis and reduction of treatment costs. Although there is little debate about immediate further examination when the hematuria is visible, there is still no consensus on the right approach towards microscopic hematuria (12,13). There are studies showing different outcomes of bladder cancer seen in young patients compared to bladder cancer detected over 40 years of age (14,15,16,17). In a study by Parkin (18), bladder cancer has been shown to be lower in grade and stage in younger patients. A study conducted by Millan Rodrìguez et al. (19) found that bladder cancer behaviors were similar in young and older group of patients. In our study, there was no significant difference in age between those who presented to the urology clinic immediately in case of hematuria. It was observed that those who had sufficient information about urology were in younger age group but those who considered tumors in the presence of hematuria were older in age. In their study, Messing et al. (20) have shown that among screened males, less cases of invasive cancer were detected than in non-screened males (4.8-23.5%). The mortality rate of bladder cancer was lower in these patients and none of the screen-detected bladder cancer patients died of the disease (20). In our study, because 65.3% of patients consulted urologist in case of hematuria and 21.5% of patients presented to emergency department seems to be enough for consciousness of being in quest of medical assistance. However, the fact that approximately 13.3% of patients do not feel the same excitement for seeking treatment may show that there is still a need for awareness. 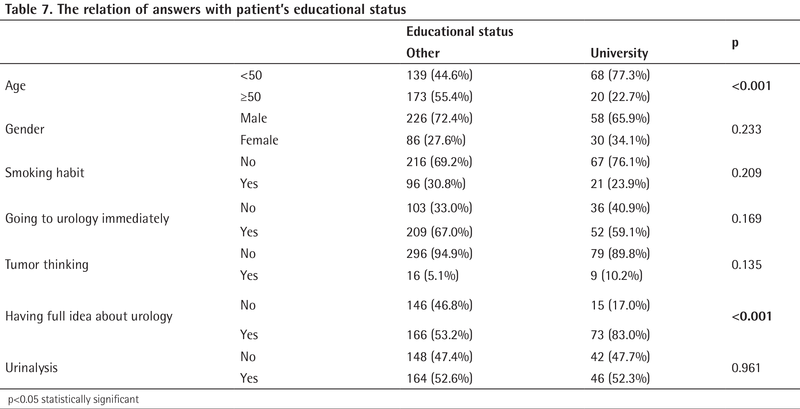 A significant difference was found only in the level of knowledge about urology in comparison with the level of education (Table 7). This reveals the necessity of raising awareness of hematuria in every part of the society. 36.5% of patients had no idea of the causes of hematuria, only 6.3% of patients thought that it could be a tumor. About half of the patients thought that only urinalysis was sufficient for the diagnosis of microhematuria. Similar to a study by Değer et al. (21), our study also showed the need for public awareness of hematuria. Education or public health campaigns; which one? Hughes-Hallett et al. (22) have shown that the effectiveness of public health campaigns was temporary on the society and generally increased hospital admission rates, but not cancer diagnosis rates. If so, it would be wise to concentrate more on educating people to raise awareness, rather than making high-budget campaigns to reduce health spending. It can be assumed that questioning of patients in the outpatient conditions may reduce the transparency of the questionnaire, since some patients coming for examination purposes were already guided by a healthcare professional. While the patients were responding to the survey questions, it was another restriction that they were not alone. Up to 17% of outpatient admissions were in patients having previous experience of hematuria that may affect survey responses. However, the fact that seeing no statistically significant difference between people with and without history of hematuria, forms the purpose of our study. Ethics Committee Approval: This study was approved by the Bülent Ecevit University Ethics Committee (approval number: 2017-84-09/08). 1. Ngo B, Papa N, Perera M, Bolton D, Sengupta S. Predictors of delay to cystoscopy and adequacy of investigations in patients with haematuria. BJU Int 2017;119(Suppl 5):19-25. 2. Ngo B, Perera M, Papa N, Bolton D, Sengupta S. Factors affecting the timeliness and adequacy of haematuria assessment in bladder cancer: a systematic review. BJU Int 2017;119(Suppl 5):10-18. 3. Bradley MS, Willis-Gray MG, Amundsen CL, Siddiqui NY. 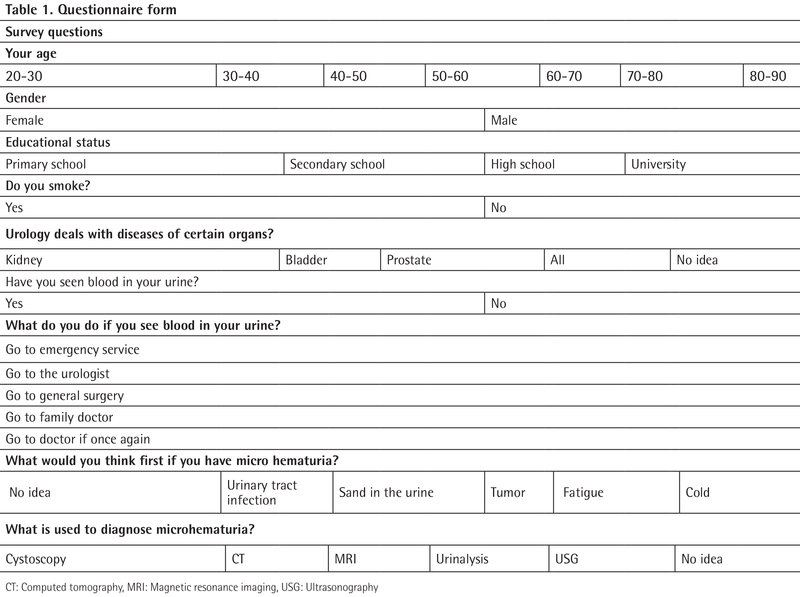 Microhematuria in postmenopausal women: adherence to guidelines in a tertiary care setting. J Urol 2016;195:937-941. 4. Grossfeld GD, Litwin MS, Wolf JS, Hricak H, Shuler CL, Agerter DC, Carroll PR. Evaluation of asymptomatic microscopic hematuria in adults: the American Urological Association best practice policy–part I: definition, detection, prevalence, and etiology. Urology 2001;57:599-603. 5. Gerber GS, Brendler CB, Evaluation of the urologic patient: History, physical examination, and urinalysis. Campbell-Walsh Urology. 9th ed. Philadelphia, 2007, pp 81-110. 6. Carter WC 3rd, Rous SN. Gross hematuria in 110 adult urologic hospital patients. Urology 1981;18:342-344. 7. Fracchia JA, Motta J, Miller LS, Armenakas NA, Schumann GB, Greenberg RA. Evaluation of asymptomatic microhematuria. Urology 1995;46:484-489. 8. Department of Health. Guidelines for urgent referral of patients with suspected cancers, London, Department of Health, 2005. 9. Mariotto AB, Yabroff KR, Shao Y, Feuer EJ, Brown ML. Projections of the cost of cancer care in the United States: 2010-2020. J Natl Cancer Inst 2011;103:117-128. 10. Larre S, Catto JW, Cookson MS, Messing EM, Shariat SF, Soloway MS, Svatek RS, Lotan Y, Zlotta AR, Grossman HB. Screening for Bladder Cancer: Rationale, Limitations, Whom to Target, and Perspectives. Eur Urol 2013;63:1049-1058. 11. Tabayoyong W, Abouassaly R. Prostate Cancer Screening and the Associated Controversy. Surg Clin North Am 2015;95:1023-1039. 12. Schmitz-Dräger BJ, Kuckuck EC, Zuiverloon TC, Zwarthoff EC, Saltzman A, Srivastava A, Hudson MA, Seiler R, Todenhöfer T, Vlahou A, Grossman HB, Schoenberg MP, Sanchez-Carbayo M, Brünn LA, van Rhijn BW, Goebell PJ, Kamat AM, Roupret M, Shariat SF, Kiemeney LA. Microhematuria assessment an IBCN consensus-Based upon a critical review of current guidelines. Urol Oncol 2016;34:437-451. 13. Linder BJ, Bass EJ, Mostafid H, Boorjian SA. Guideline of Guidelines: Asymptomatic Microscopic Haematuria. BJU Int 2018;121:176-183. 14. Johnson DE, Hillis S. Carcinoma of the bladder in patients less than 40 years old. J Urol 1978;120:172-173. 15. Wan J, Grossman HB. Bladder carcinoma in patients age 40 years or younger. Cancer 1989;64:178-181. 16. Kutarski PW, Padwell A. Transitional cell carcinoma of the bladder in young adults. Br J Urol 1993;72:749-755. 17. Kurz KR, Pitts WR, Vaughan ED Jr. The natural history of patients less than 40 years old with bladder tumors. J Urol 1987;137:395-397. 18. Parkin DM. Global cancer statistics in the year 2000. Lancet Oncol 2001;2:533-543. 19. Millan Rodrìguez F, Chechile-Toniolo G, Salvador-Bayarri J, Palou J, Vicente-Rodríguez J. Multivariate analysis of the prognostic factors of primary superficial bladder cancer. J Urol 2000;163:73-78. 20. Messing EM, Madeb R, Young T, Gilchrist KW, Bram L, Greenberg EB, Wegenke JD, Stephenson L, Gee J, Feng C. Long-term outcome of hematuria home screening for bladder cancer in men. Cancer 2006;107:2173-2179. 21. Değer D, Aslan OD, Çömez K, Eren F, Adırbelli S, Aslan G. Social Awareness on Early Diagnosis and Treatment of Bladder Cancer: Importance of Age and Education. Bulletin of Urooncology 2017;16:12-16. 22. Hughes-Hallett A, Browne D, Mensah E, Vale J, Mayer E. Assessing the impact of mass media public health campaigns. Be Clear on Cancer ‘blood in pee’: a case in point. BJU Int 2016;117:570-575.